With multiple instances, you can leverage additional ad delivery from the ironSource network. We support multiple instances for Rewarded Video and Interstitial ad units. 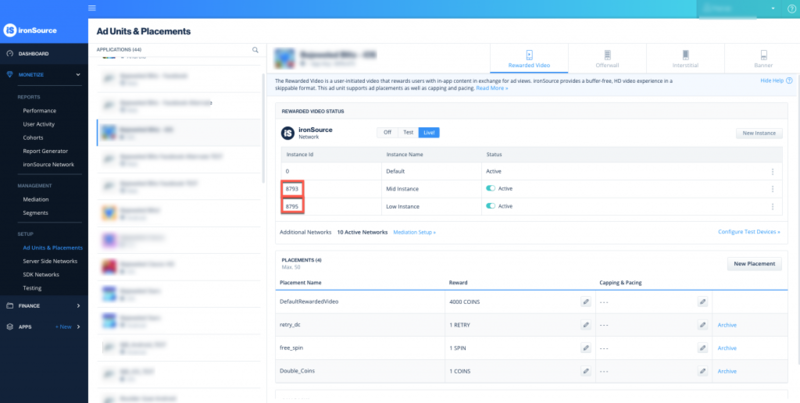 Multiple instances allows you to expand revenue opportunities from ironSource, by allowing our network to serve at multiple locations in your waterfall stack. For example: You can place one instance of ironSource at the top of your waterfall with a high fixed CPM rate, while allowing ironSource the opportunity to show again at a lower waterfall position, generally with a lower CPM rate. This allows you to optimize your ad revenue return from ironSource. CPM Pricing allows you the control and flexibility to define expected CPM rates from ironSource’s network. 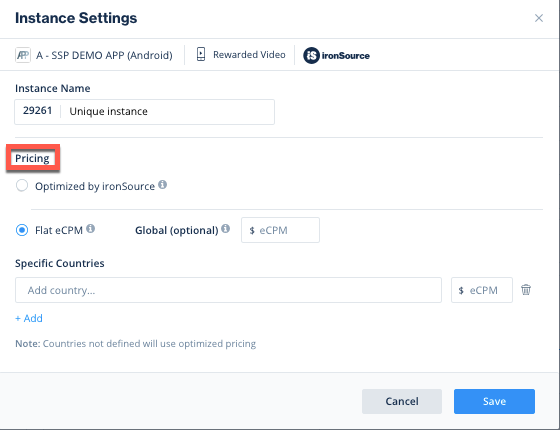 Using CPM Pricing on a the instance level facilitates the use of ironSource network at multiple locations in your waterfall, each with different price points that ironSource needs to deliver. To set your CPM Pricing per instance, navigate to the relevant ad unit page and click on the ‘Edit‘ icon to open the App Settings window. Select the relevant instance to define the pricing. Optimized by ironSource: ironSource will self optimize to achieve the highest eCPM and revenue performance. This will not hold a static CPM value. Flat eCPM: Define a CPM that the ironSource Network needs to meet to serve an ad. CPMs can be set on individual or groups of specific countries, and on the global level. Global pricing is optional and can be used in conjunction with specific countries. Setup 3 unique instances per waterfall: For every custom waterfall you are creating, on both the country and ad unit level, we recommend to create 3 unique ironSource instances. A high-priced instance that should be placed at the top of the waterfall, where we will served our highest value ads. A mid-priced instance that should be placed in the middle of your waterfall. A low instance that should be placed towards the bottom of your waterfall or in the auto-optimization section, where we will pick up the remnant inventory with the highest fill rate. It’s best to allow ironSource to automatically optimize eCPM for this instance to ensure highest fill. If interested in using CPM Pricing, please reach out to your Account Manager or Contact Us for more information. Done! You’ve successfully added additional ironSource instances! Head to our Best Practices Guide for tips on how to best manage your waterfall with Multiple Instances.